Not considered a new concept, a good portion of the rest of the world have been accustomed to using their mobile handsets much like a credit card. Expected to go live soon here soon with a lot of expectation behind it, Visa and DeviceFidelity Inc. are on the verge of getting ready their iPhone case that acts as a tap-to-pay Visa credit card. Thanks to Apple's part in making this whole thing become a reality, they've given it a thumbs up as they offered the certification needed for the accessory. Basically the iPhone case works in conjunction with an application on the phone that's password protected and allows owners to use their smartphone just like any credit card – but it only will function with contactless payment terminals. 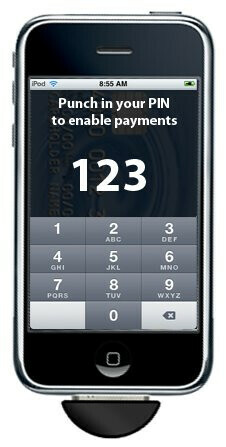 The application on the iPhone, called Visa payWave, allows the technology to flow seamlessly for both the iPhone 3G and 3GS. Now that the iPhone is on board with this, it may spur a huge amount of usage that could potentially see it grace other phones down the road. Although it isn't out just yet, market trials are expected to happen some time this summer – so that means a release could be hiding somewhere in the horizon. Dont the apple store employees have these on their iphones? No apple store employees can swipe visas with their ipods. This turns and iphone into a visa. wow, I think phones just became more expensive.